Scott Babbage might have claimed the qualifying series after three days of racing at the Moth Worlds but it is the three-way tie for second place between Joshua McKnight, Bora Gulari and Anthony Kotoun that promises plenty of action over the next three days. It was a tricky day for the 125-strong Moth fleet on Lake Garda. Although the African heat wave has since receded, day temperatures were still too high for the afternoon Ora breeze to build up and let the Moths fly on flat waters in the typical 15 to 18 knots. As a result, the breeze arrives later and is much more unstable and trickier. The first race got underway in 10 knots of breeze and Bora Gulari showed his form by dominating the Yellow fleet to finishing ahead of Babbage. 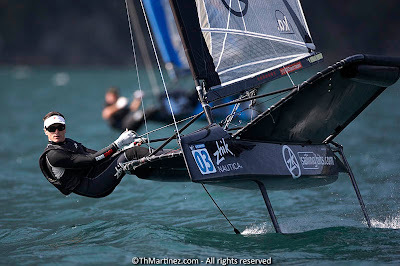 In the Blue fleet, Australian Joshua McKnight confirmed why he’s an up-and-coming young gun, scoring his third victory in nine races. Anthony Kotoun, who still likes to call himself a rookie, was close behind. The second race took place in the fading Ora that once again forced the race committee to shorten the course. 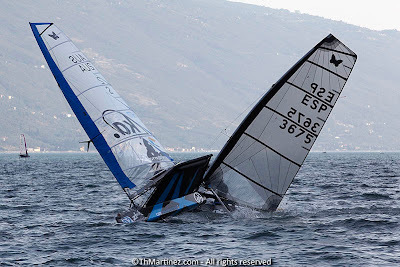 It was a tactically tough race with big wind holes everywhere. Still, once again, Bora Gulari led the Yellow fleet. Was he lucky? They say that luck is when preparation meets opportunity. Gulari must certainly have had both. Another young gun, Great Britain’s Chris Rashley, was first in the Blue fleet, scoring his first victory this week. Despite this being his first world championship, the current UK Moth Champion has shown remarkable consistency, never finishing worse than seventh. 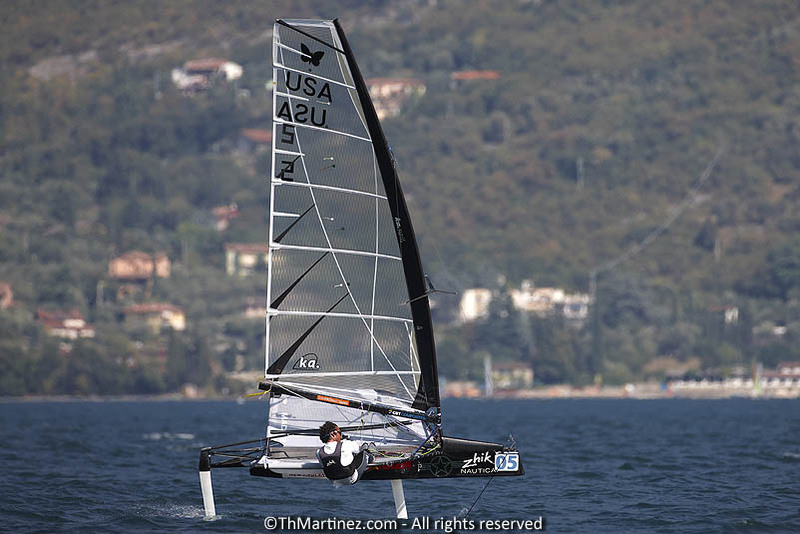 The boats will now be split into two fleets, based on their ranking in the qualifying series, with the top half going into the Gold fleet and the remaining yachts into the Silver fleet. 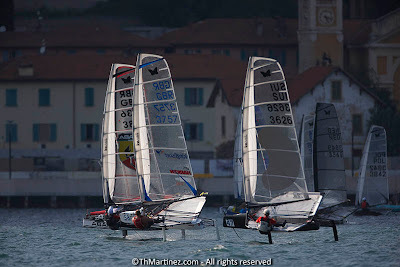 Each skipper’s ranking in the qualifying series will be counted as a non-discardable race score for the final series and their score for the regatta will be the total of their final series race scores together with the non-discardable qualifying series rank. The schedule calls for nine races in the final series on Friday, Saturday and Sunday. 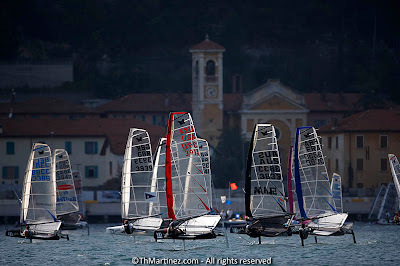 Friday’s races will start, weather permitting, at 2:00 pm local time and similar conditions that are expected to what the Moths have experienced so far this week. 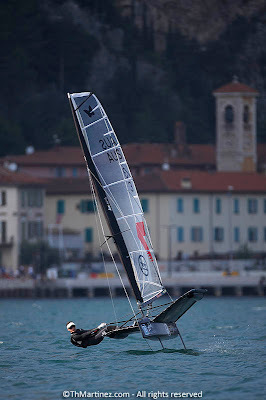 Chris Rashley (GBR): “We are not really anywhere into week, we just finished the qualifying series. We had four days, we missed one and we finished the qualifying series with some good races but all the real racing will take place now in the gold fleet.